Today we're thrilled to be premiering the debut album from Melbourne singer-songwriter Augustine Ang - Heart & Brain is a collection of lo-fi folk pop that brims with spirit and rough-around-the-edges charm. It can be something of a bold move introducing yourself to the world with a debut album, but considering the level of self-assurance and sophistication we hear across Heart & Brain, it's clear Augustine Ang has made the right choice. Across the album's ten tracks, Augustine takes us on a striking journey through different sounds and moods, and although he maintains a relatively stripped back folk aesthetic throughout, still manages to transport listeners into his own sonic world. Heart & Brain opens with 'One Heart' and immediately sets the tone for what's to come, with its sprawling acoustic guitars, warbly double-tracked vocals and Augustine's deceptively immersive lyrics. The next few tracks keeps this vibe going, with the addition of meandering electric guitars or ethereal layers of sound that drift in and expand things further, especially so on the mesmerising 'We Are Friends'. The album continues on with a handful of more tender moments, showcasing Augustine's impressive fingerpicking skills while he captivates listeners with his poignant storytelling before wrapping up with 'The Sea', an album highlight that perfectly rounds things out with its rustic folk feel before we're lost in the sunny melodies and flickering sound effects. Heart & Brain is a really strong debut release from Augustine Ang and a powerful way to introduction himself to the world, so the celebrate the album, we caught up with the man behind it all to find out a little more. TJ: Hey Gus, good to meet you! What’s the story? AA: Hey James! Nice to meet you too. I've just been steaming up some beets I was gifted from a friend's garden. Did you know you can eat the beetroot leaves too? Super yum. You’ve just release your debut album Heart & Brain - tell us a bit about it. The album is a reflection on balancing between going with the flow (heart) and rationalising everything (brain). I feel like the heart is one of the most vulnerable parts of your body and is always accepting and forever beating. The brain is not always open minded and it's forever analysing everything - either for good or bad! In recent years I've been doing a lot of self exploring and travelling, and the heart and brain both became a recurring theme in my songs. Despite the album being relatively stripped back, it’s full with colour and character. How’d the writing and recording happen? The 10 tracks on the album were written over a few periods. Specifically, two songs from my 2013 trip to South Africa, four songs from my 2015 trip to Colombia, and four songs written at home here in Melbourne. Yes, I was definitely going for a stripped back sound, so I'm glad that came through! Recording was done at home in my bedroom, bathrooms and wardrobes. If I’m correct, you’ve also played in a few local bands before going solo - what inspired you to make the move? Yeah that's right! I was a member of Smirks which was a lot fun. We used to swap instruments between guitar, bass and drums. I decided to take a step back from the band to focus more on my solo project. I've had so much to learn about releasing my first album, so the break from the band has really helped get the ball rolling. I'm hoping to do a small album tour in April 2019 which would include Victoria, ACT and NSW. Otherwise, more writing for a possible follow up album. Thanks heaps for the premiere and the chat! 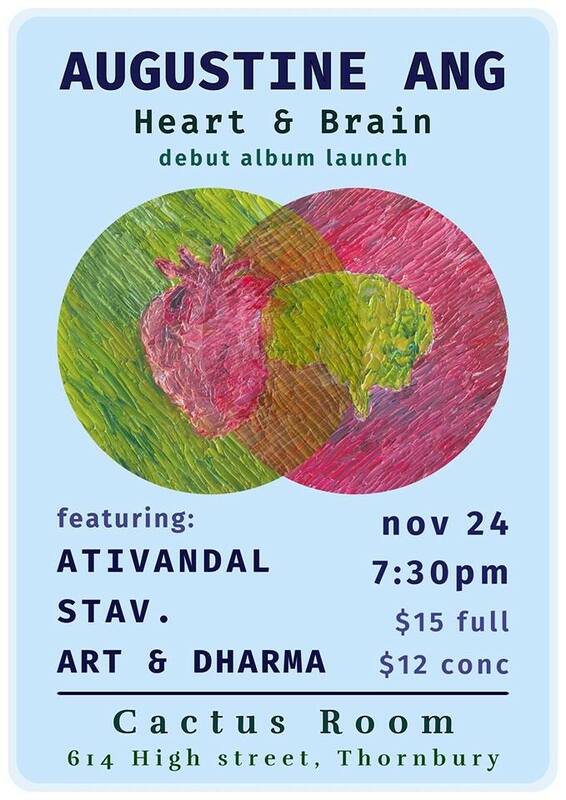 Have a listen to Heart & Brain above, and catch Augustine Ang launching the album on November 24th at the Cactus Room in Thornbury.